Japanese spacecraft, Hayabusa2 has surveyed asteroid Ryugu's surface and landed multiple robotic probes on its rocky terrain. Asteroid Ryugu is far drier than expected. Ryugu is quite young (by asteroid standards), at around 100 million years old, this suggests its parent body was much largely devoid of water, too. Ryugu has an oblate "spinning top" shape, which suggests that the rocky body may have once spun at twice its current rate. Hayabusa2 has completed the touchdown manoeuvre to collect samples from Ryugu's surface, which will be brought back to Earth in a return capsule in late 2020. Hayabusa2 is an asteroid sample-return mission of the Japanese space agency, JAXA. 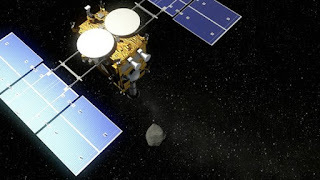 It is the successor of Hayabusa which had returned asteroid samples in 2010. Hayabusa2 arrived at Ryugu on 27 June 2018 and would survey the asteroid Ryugu for a year and a half during which time it will also collect samples. The mission plan is expected to depart in December 2019 and return the samples to Earth in December 2020. Asteroid Ryugu is a near-Earth object and a potentially hazardous asteroid of the Apollo group. Asteroid Ryugu is a primitive carbonaceous near-Earth asteroid. Asteroid Ryugu is expected to preserve the most pristine materials in the Solar System, a mixture of minerals, ice, and organic compounds that interact with each other. The studies of Asteroid Ryugu is expected to provide additional knowledge on the origin and evolution of the inner planets and, in particular, the origin of water and organic compounds on Earth and all relevant to the origin of life on Earth. Q. Which Japanese spacecraft has surveyed asteroid Ryugu's surface and landed multiple robotic probes on its rocky terrain?